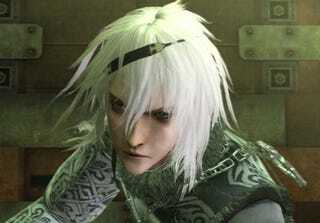 The younger model of Nier that appeared in Japan's PlayStation 3 exclusive Nier Replicant makes a special Western appearance in The World of Recycled Vessel, downloadable content for Square Enix's action-RPG which explores the past of the grizzled protagonist. In Japan, Nier came in two flavors: Nier Gestalt, the game I recently played and loved, and Nier Replicant, the PS3 version which changed the father-daughter mechanic into a brother-sister one, to better appeal to Japanese players. Rather than let the younger character model go to waste, Square Enix and developer Cavia are using it in the first batch of downloadable content for the game, The World of Recycled Vessel. The diary entries of Nier's wife became stranger and stranger as the Black Scrawl took hold of her body and edged her mind towards madness. "Recycled Vessel. Severance. Penance. Aberrance. Sufferance. Acceptance. Disturbance. Hindrance. Defiance. Forbearance. Intolerance. Vengeance. Repentance. Radiance. Extravagance. Malignance. Vigilance. Obeisance. Dominance. Allegiance. Resistance. Discordance. Petulance. Misguidance. Deliverance." The DLC features 15 challenge levels, an additional bonus quest, new music created just for the downloadable content, three powerful new weapons, and two unlockable new costumes for each of the game's three main characters, Nier, Emil and Kainé, two of which can be seen here. Currently the DLC is listed for release in Europe for the Xbox 360 on May 11 for 560 Microsoft points, with the PlayStation 3 version going on sale on May 12 for €6.99. North American prices and dates may vary.